Bausch + Lomb, an American company founded in Rochester, New York, is one of the world's largest suppliers of eye health products, including contact lenses, lens care products, medicines and implants for eye diseases. The company was founded in 1853 by an optician, John Jacob Bausch, and a financier, Henry Lomb. Its Ray-Ban brand of sunglasses was sold in 1999 to the Italian Luxottica Group. Bausch + Lomb was a public company listed on the NYSE until it was acquired by the private equity firm Warburg Pincus PLC in 2007. In May 2013, Valeant Pharmaceuticals agreed to buy Bausch + Lomb from Warburg Pincus LLC for $8.57 billion in cash. The deal, which was approved by share holders, included $4.2 billion earmarked to pay down Bausch + Lomb debt, and closed on August 5, 2013. Today, the company is headquartered in Bridgewater, New Jersey, and employs about 13,000 people in 36 countries. 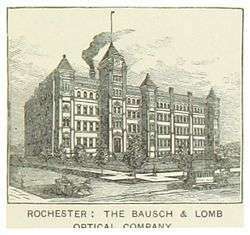 Bausch + Lomb was founded in 1853 by John Jacob Bausch and Henry C. Lomb both German immigrants, in Rochester, New York. A trained optician, Bausch found in Lomb the financier and partner he needed for a small but ambitious workshop producing monocles. In 1861, the company manufactured Vulcanite rubber eyeglass frames and other precision vision products. During the American Civil War, the Union blockade caused the price of gold and European horn to rise dramatically. This resulted in a growing demand for the Bausch & Lomb spectacles made from Vulcanite. In 1876, the company began manufacturing microscopes. Later that year, the Bausch & Lomb Optical Company won a distinction at the Philadelphia Centennial Exposition. The company also produced photographic lenses (1883), spectacle lenses (1889), microtomes (1890), binoculars and telescopes (1893). From 1892 in cooperation with Zeiss in Germany, the company produced optical lenses. In this manner, at the end of the 19th century, the product range included eyeglasses, microscopes and binoculars, as well as projectors, camera lenses and camera diaphragms. With the growth of the US army, under President Theodore Roosevelt and the buildup of the naval fleet, Bausch & Lomb received the commission, through the supplier Saegmuller, to manufacture high-precision lenses for optical measurement and founded a joint venture with Saegmuller. At the same time as this new expansion, a research department with five members was started to develop new products and improve old ones. A new alliance with the Zeiss company in Germany ensured competitive advantages for the three participants, Bausch & Lomb, Saegmuller and Zeiss, in terms of patent use and opening new markets. In 1902, William Bausch, the son of the founder, developed a process to create the desired lens shape directly by casting molten glass. Previously, the glass parts for the lenses had to be separated, ground and polished in a complicated process, and this brought significant savings in time and materials. The company produced the first optical-quality glass in America during the early to mid-1900s. By the year 1903 the company began manufacturing microscopes, binoculars, and camera shutters. The further development of the firm was affected by political events. Because of the World Wars and the consequent need for optical instruments such as field glasses, target finders, camera lenses, binocular telescopes, searchlight mirrors, torpedo tube sights, and periscopes, the product range could be considerably broadened. Until World War I, optical glass and the instruments made from it (including many military instruments) were often imported into most European and North American countries from Germany. The same was also true of chemical products and laboratory equipment. The outbreak of the war, with Germany's new enemy status, created a scramble to rapidly enhance the domestic industries. In 1933, Bausch+Lomb started to honor outstanding high school science students with the Bausch+Lomb Honorary Science Award. In the 1930s, military products represented 70% of total production. The Ray-Ban brand of sunglasses was developed for pilots in 1936. After the Second World War, the photography and eyeglass sectors were strengthened and production in these sectors, at least in part, was completely restructured. In addition, production facilities were opened in Canada, Brazil and Argentina. At a time when the cinema was being superseded by television, Bausch & Lomb developed the CinemaScope lens. For the first time, the new lens made the "wide screen" effect possible, enabling cinemas to double screen width. After three years of development work, two years for the medical approval by the United States Food and Drug Administration (FDA) and an investment of three million USD, Bausch + Lomb brought the first contact lenses made of Poly-HEMA on the market in 1971. In contrast to the contact lenses available up to that time, made of glass and Lucite (acrylic glass), the new lenses were softer, and were marketed with the brand name "Soflens". In the 1970s, Bausch + Lomb became a major producer of spectrophotometers for the dye and chemical business. A massive restructuring of the company began in the mid-80s. What had been the core divisions, the production of lenses for various purposes, were sold off. The sunglasses division was continued, since Ray-Ban glasses kept selling very well due to effective product placement. By the planned acquisition of other firms, such as Polymer Technology Corporation and Dr. Mann Pharma, existing business areas, for example contact lens production, were strengthened and new ones were opened up. Finally in 1997, as a result of a series of company acquisitions, the division for the production of surgical products was established. Since then, Bausch & Lomb has developed into a globally operating company which is one of the largest producers of contact lenses. Today, about 13,000 employees in 36 countries work for the firm. Total turnover for the year 2006 was estimated at 2.29 billion USD. The company's competitors in the international health-care services market are Johnson & Johnson, Alcon, Allergan, MSD-Chibret and Ciba Vision (Novartis). Although in the last few years several business areas in the Vision Care division have been developed in the framework of product diversification, the manufacture of contact lenses still accounted for 28% of turnover in 2001 and was thus its main business activity. Besides the simplest "SofLens One Day" soft contact lens range, which have to be changed every day, the product assortment also includes higher quality lenses, such as the "SofLens Comfort" or "Seequence" lenses which can be changed after two weeks. The "SofLens66 Toric" were specially designed for people with astigmatism. Lenses from the "Boston" range have a higher oxygen permeability and thus are more suited for people with sensitive or dry eyes. The newest and most advanced lens range is called "PureVision". These lenses are so oxygen-permeable that they can remain in the eye up to 30 days without being taken out at night. The second largest business, at 25%, is the manufacture of lens-care products. As well as simple combination cleaning and disinfectant solutions for both soft and hard lenses, pH neutral solutions are available for people with particularly sensitive eyes. The Pharmaceuticals division manufactures pharmaceutical eye products, which account for 21% of turnover. This range covers prescription medicines for eye irritation, allergic reactions or high eye pressure. A further breakthrough is expected from the new Envision TD product range. This represents a new process for the precisely located dispensing of active substances to the eye. This is achieved by medical implants behind the eye. Due to the body's absorption process, the implant slowly decomposes and in so doing releases the desired active substance directly to the eye over a long period. Additionally, vitamins can be dispensed to counteract bacterial infection and allergic reactions, thus reducing loss of vision with advancing age. The development of this division was speeded up by take-overs of other firms. The Surgicals division is divided into Refractive Surgery with 8% of turnover and Cataract Vitreotinal Surgery with 18%. The latter division is concerned with products for operations on glaucoma and cataracts and on the cornea, as well as implantable, interocular lenses. The Refractive Surgery division comprises mainly medical analysis devices and lasers required for eye surgery. In order to strengthen this division, the competing, market-leader companies Storz and Chiron were acquired. Bausch + Lomb was in a lawsuit with Novartis which claimed to have patents on a Bausch + Lomb product called PureVision. On June 26, 2002, a federal judge ruled that Bausch & Lomb did infringe on Ciba Vision (a subsidiary of Alcon) patents. On July 2, 2004, the company announced that it had licensed the intellectual property of Novartis. Bausch & Lomb will pay the Ciba Vision unit of Novartis a royalty on net U.S. sales of its PureVision brand contact lenses until 2014 and on net sales outside the U.S. until 2016. But as of now, the brand FreshLook comes under Bausch and Lomb and Ciba manufacturers it. On April 11, 2006, Bausch & Lomb stopped shipments of its ReNu with MoistureLoc contact lens solution when the Centers for Disease Control and Prevention (CDC) announced there was a high correlation between use of the product and cases of suspected fungal keratitis. The Centers for Disease Control found that "nearly all of the company's ReNu with MoistureLoc eye care products were linked to severe fungal eye infections". Two class action lawsuits have been filed against Bausch & Lomb in relation to the eye fungus problems. Bausch & Lomb received a 100% rating on the Corporate Equality Index released by the Human Rights Campaign starting in 2003, the second year of the report. ↑ "Valeant's High-Price Drug Strategy". New York Times. 2015. ↑ "Bausch & Lomb: The Bausch + Lomb story". Archived from the original on 1 May 2007. Retrieved 2007-04-19. ↑ "Investors' Overview". Bausch & Lomb. Retrieved 30 January 2014. ↑ "Archived copy". Archived from the original on 2014-05-29. Retrieved 2014-05-28. ↑ Kolbow, Berti (2014). "John Bausch". Immigrant Entrepreneurship: The German-American Business Biography, 1720 to the Present. Retrieved May 20, 2014. ↑ "German American Corner". German Heritage. 2014. ↑ "A History of Bausch and Lomb". nwmangum.com. Source: Kingslake, Rudolf, 1974, The Rochester Camera and Lens Companies, Rochester NY, Photographic Historical Society. ↑ Bausch & Lomb Optical Company (February 1920), "The end of a foreign monopoly (Bausch & Lomb Optical Company advertisement)", Popular Science, 96 (2). ↑ The global leader in acrylics. Lucite International (2011-07-14). Retrieved on 2013-08-23. ↑ "Company News: Bausch + Lomb is found guilty of patent infringement". New York Times. 2002-07-27. Retrieved 2007-04-19. 1 2 "Bausch & Lomb, Ciba Vision reach settlement of patent litigation". The Daily Record (Rochester, New York). 2004-07-07. Retrieved 2007-04-19. ↑ "Fusarium Keratitis — Multiple States, 2006". 2006-04-14. Archived from the original on 17 May 2007. Retrieved 2007-04-19. ↑ Crane, Mary (2006-05-03). "More Recalls Ahead For Bausch & Lomb?". Forbes. Retrieved 2007-04-19. ↑ "Eye Fungus Lawsuits Filed: Bausch & Lomb Could Face Class Action Suit Over Lens Solution". Associated Press. 2006-04-20. Retrieved 2007-04-19. ↑ "Corporate Equality Index (2003)". Human Rights Campaign Foundation. 2003. Archived from the original on 2007-09-30. Retrieved 2007-04-19. Wikimedia Commons has media related to Bausch & Lomb.